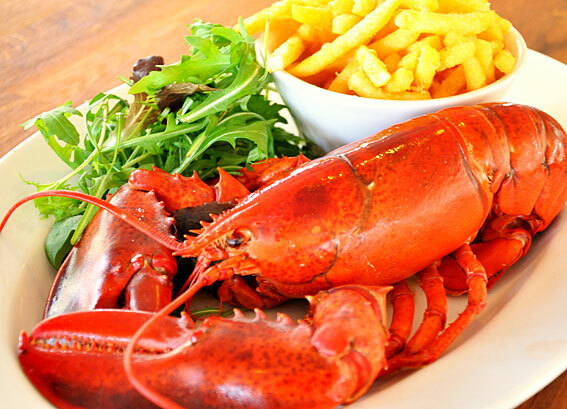 Lobster has always be one of those extravagant meals which few people ever try because of the high cost. With restaurants paying thirty dollars a pound, by the time they put their markup on it, you’re easily paying sixty dollars for a ten ounce tail. This high cost leaves lobster dinners for the well-to do or at least only for special occasions. But, this doesn’t have to be. With more and more retail store offering lobster, you can create a romantic dinner for two at a reasonable price. If you buy two eight ounce tails for thirty dollars, that’s only fifteen dollars a person. Add a starch and vegetable and it’s still cheaper than going out to dinner and having steak or even chicken. Turn the lights down low, add a candle and ship the kid’s off to grandma’s house. Cooking lobster is relatively easy. There are hundred’s of recipes on the internet or in books. The simplest way is to split the shell down the top, pull the meat out of the shell about 90% of the way and lay it on top of the shell. Place in a pan with a little water and cover with foil (do not let the foil touch the lobster). Cook at 350 degrees until the meat turns white (around 140 F) then baste with butter and season with salt and pepper. As with any food, avoid the temptation to overcook it. When overcooked the lobster meat will become tough and less appealing. Lobsters are ten legged arthropods, meaning they have no backbone. The lobster creates its skeleton on the outside in the form of a shell with joint appendages. There are two major types of lobster on the market. Maine also called Canadian or American lobster and spiny sometimes call rock lobster. The spiny lobster is a clawless warmwater variety, which are actually large seagoing crayfish. There are 49 species of spiny lobster which swim the world’s warm waters. Because the tail is the only real edible part of the spiny lobster, it is usually sold frozen as a lobster tail. The spiny lobster found off Florida, Brazil and the Caribbean are called “warmwater tails”, while those found off South Africa, New Zealand and Australia are markets as “coldwater tails”. The coldwater variety of spiny lobster is considered superior and favored among restaurants. Cooking lobster at home can be a delicious alternative to going out. Why not give it a try?